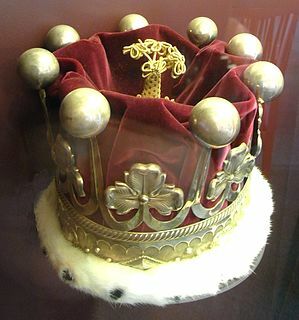 The coronet was made in 1846, designed by Johannes Flintoe based on a crown dating from the Middle Ages, and commissioned to the goldsmith Herman Colbjørnsen Øyset. It was originally made for Crown Prince Carl of Sweden, future King Charles XV. 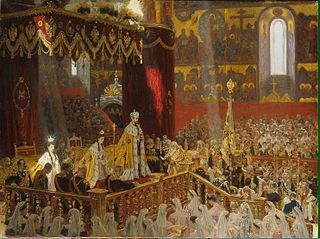 It was meant to be used by Carl when his parents Oscar I and Josephine were crowned, but the ceremony never took place. It is the only piece of Norway's coronation regalia to be made entirely within Norway, and it has never been worn. 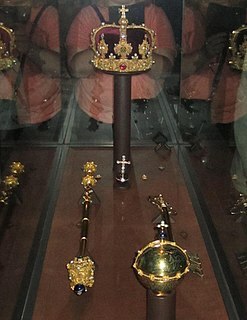 It is a crown of the open type with spikes. It weighs a little over 1 kg, and contains a green peridot, freshwater pearls and an amethyst. Official Site - Page of the Crown. Prince Carl of Sweden and Norway, Duke of Västergötland was a Swedish prince. Through his daughters, for whom he arranged excellent dynastic marriages, he is an ancestor of several members of European royal houses today, including the reigning monarchs King Harald V of Norway, King Philippe of Belgium, and Grand Duke Henri of Luxembourg. Princess Märtha of Sweden was Crown Princess of Norway as the spouse of the future King Olav V from 1929 until her death in 1954. The presently reigning King Harald V is her only son. Märtha was also a maternal aunt of Baudouin of Belgium and Albert II of Belgium.